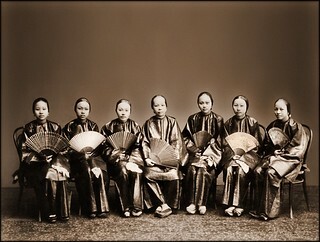 Entitled Group Of Chinese Women With Fans, Canton China [c1880] Afong Lai [RESTORED] I evened out the background, darkened the entire print, added contrast and a sepia. Afong Lai was one of the rare breed of Chinese photographer whom was recognized by his European contemporaries as a professional equal. He was well thought of by the legendary John Thomson, who rated Afong's work of a caliber that would be successful even if offered to the English in London. As a Chinese working in what was then considered to be a strictly European field, Afong established and fostered contacts with many foreigners, allowing his work to be brought home by Europeans and thus to be seen abroad. For this reason, historic examples of his work survives to this day. He was active in and around the Guangdong area (then called Kwangtung), particularly in Hong Kong, where he ran one of the colony's longest working photographic studios, reportedly from 1859 through 1900. Professionally, Afong Lai specialized in portraiture and landscapes, and was well known for his stitched panoramic views. Unfortunately, other than his technical and artistic achievements, little of his personal life was ever recorded. In fact, there is even question over his proper name; that is, was his surname Fong or Afong, or Ah Fong? I suspect that this arose from the lack of western linguistic appreciation for the Cantonese dialect. Cantonese speaking Chinese would immediately recognize the "Ah" preceding Fong as just a colloquialism (denoting intimacy or familiarity). This is similar to the "Lil" (a truncation of Little, in this case, used as a term of endearment or affection) that may precede a typical American name like Joe. However, most non Chinese observers of Fong's times did not intuitively understand this distinction, and mistakenly assumed his proper name to be Mister Ahfong. An English version of this mistake would be referring to someone as Mister Liljoe. 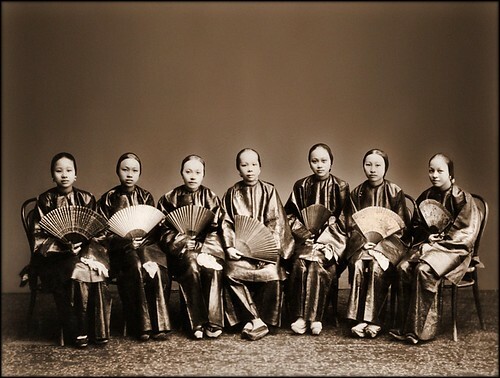 Despite this mistake of not having his real name remembered, it nonetheless burnished Fong's undeniable place in history as one of the great photographers of late Qing China. On Afong's stationary, it is clear that the printed name in English is AFONG. However, what is often lost to the English reader is the Chinese text, which reads Fong Wah, likely an amalgam of the proprietor's own name into the title of his business enterprise. In this case, that would mean that the owner's surname is simply Fong. The letter "A" (for "ah") placed in front of the surname Fong (a typical Cantonese surname), likely reflected the Chinese colloquial term of affection or endearment, but more importantly, also the title that Europeans normally knew Mr Fong as. Hence, Mr Fong probably kept that in his official English title as it was how he was best known to his foreign customers. Had Mr Fong been European say, with a name like Thomson, local Chinese may have then referred to him as Ah Thomson. It would have then been obvious that the colloquial "ah" was not a part of Thomson's name.